the Vedic personification of Jupiter. Astronomers believe that Jupiter is a gaseous giant, with an atmosphere composed mostly of ammonia. In 2011 NASA launched the space probe, Juno to fly past Jupiter and gather more information about the planet's surface, atmosphere and magnetic fields. In Greek mythology, Juno was Jupiter's wife and this probe has presently completed half of it's journey and is due to rendezvous with the planet in July 2016. Prior to this, the NASA probe Voyager 1 flew past Jupiter in 1979 and gathered stunning pictures of the planet's atmosphere and famous 'Great Red Spot'. Astrologically, Jupiter is considered to be a hot, sanguine, airy, beneficent, masculine, social, learned and stately planet. He upholds temperance, justice and moderation. Known as the 'Greater Fortune', Jupiter rules over the fiery, magnetic sign Sagittarius and the watery sign, Pisces. In Hindu mythology, Jupiter was the wise, learned and influential spiritual guide or teacher to the Gods, who principally worshipped Lord Vishnu. Jupiter's exaltation is in fifteen degrees of Cancer. An individual born under Jupiter's influence will be tall, well built, upright, handsomely proportioned, robust and ruddy, with a commanding personality. He should have oval face, high forehead, full eyes, thick hair, wide chest, long feet and a firm and frank manner. When Jupiter has a favourable influence, the concerned individual will be wise, magnanimous, progressive, jovial, mild mannered, temperate and just. Such a person will show a definite inclination towards spirituality, the metaphysical, religion and philosophy and a desire to expand their knowledge. When this planet is debilitated or conflicted, the individual will be conceited, careless, indifferent and a prodigal with limited abilities. Such a person can be easily influenced or led astray and can also be fanatical. The true character of this planet will make the native good natured, just, free-spirited, such a person will always try to do the right thing in life and will hence, enjoy the confidence of others. A strong positive influence of this planet can increase the chances of success in all aspects of life, instilling sound judgement and unusual vision. Jupiter governs the liver, lungs, the veins, blood and all the viscera. The diseases associated with this planet are those which arise from an excess of body fluids or blood disorders. When Jupiter or it's zodiac signs are afflicted, particularly by Saturn, the individual must take care to prevent the liver from becoming torpid or damaged. Jupiter has a dominating influence over everything in existence, however it also has a dual nature, depending on it's position and aspects. For example, if Jupiter is in aspect to Mars, the native derives tremendous executive ability. However, if it in aspect to Saturn, it has a subduing influence and restricts optimism and faith. In general, Jupiter may be considered the exact contrary of Saturn, as this planet constricts and conserves, while Jupiter expends and is free-flowing. Jupiter is the instinct of creation, generosity, hospitality and spiritual knowledge. Venus combines well with Jupiter and if these planets are strengthened by a third planet of more robust and sever character, there is a tendency towards softness. In such cases the effects Uranus, Mars, the Sun and Saturn can be beneficial. In Sanskrit the Jupiter is called 'Guru' or 'Brahaspathi' and this name is used in Vedic astrology. Jupiter is the largest planet in the solar system and in Vedic astrology it is sometimes referred to as the 'Prime Minister' of the solar system. For the unfamiliar, you may consider Jupiter to be the head of a planetary cabinet. Jupiter represents righteousness, wisdom, spiritual enlightment, benevolence, mercy, philanthropy, honesty, good fortune, harmony, equanimity, intelligence, joviality, prosperity, fame, political power, good fortune, financial gains, long journies and virtues. Jupiter is also considered to be, 'The Great Teacher'. It is the lord of the zodiac signs Sagittarius and Pisces. It is exalted in Cancer, and debilitated in Capricorn. It is responsible for impurities of blood, jaundice, fever, indigestion and disorders of the heart, lungs, spleen and liver. The corresponding colour for Jupiter is yellow. 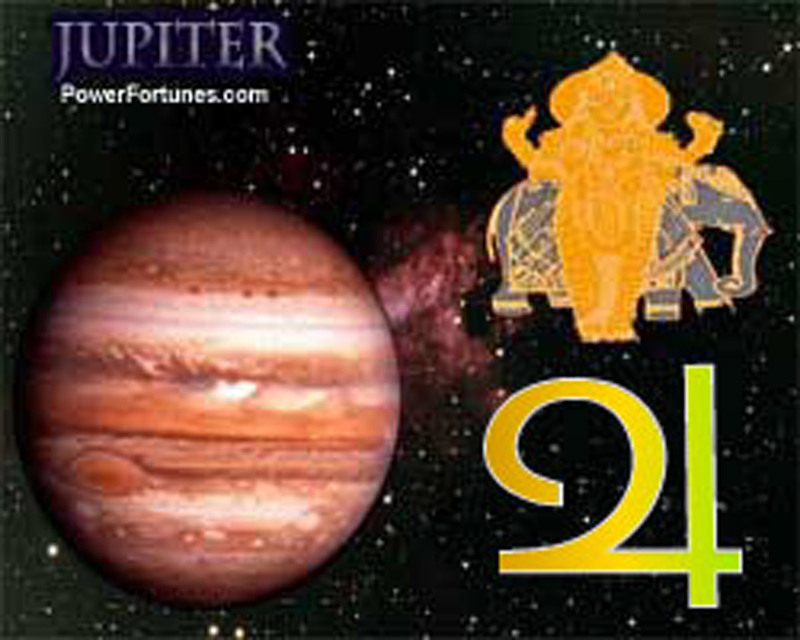 According to numerology, Jupiter's number is '3'. It is the lord of the vegetable kingdom and the north-east direction. It represents gold and topaz or yellow sapphire are it's corresponding gemstones. The direction associated with Jupiter is, North-East. The corresponding talisman for Jupiter is the 'Brahaspathi Yantra'.